Ring-top drapery is sophisticated and contemporary. 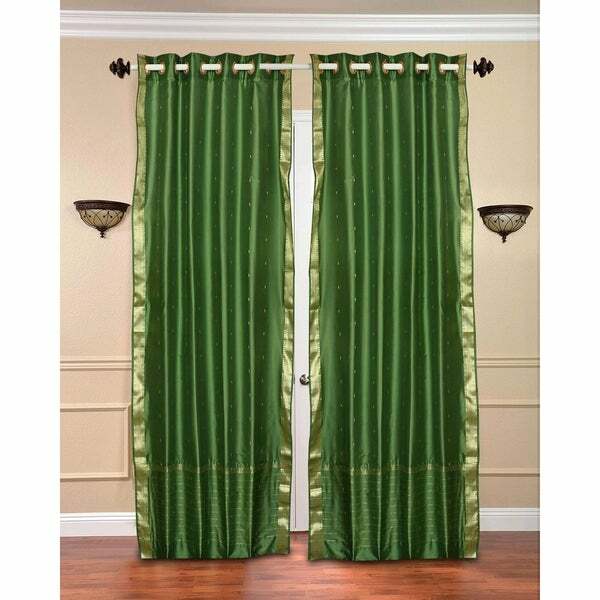 Ring-tops have decorative rings attached to the drapes. Rings create a pleated look that is crisp and modern. The fabric of these curtains are weaved on a hand-loom in a small rural village in India and then hand-dyed. The artisans are a group of young hand-crafters who have moved from small villages to a big town in Central India and make various home decor items out of these exotic sari fabrics. This gives these wonderful artisans a way to have sustainable income via selling to the worldwide market on the internet. Your purchase supports local and home-based work where the artisans can easily tend to their families and pass these time-honoForest Green skills from one generation to the next.